Recently the T-SQL Tuesday topic was Power BI. A cool topic, and an interesting application. I saw Rob Farley build a dashboard based on his Fitbit data. That was intriguing, so I went to get my data. I’ve worn a Fitbit for a couple years, recently having lost it. However, when I went to export my data from Fitbit, I found this. Notice two things. One is the top announcement that my data belongs to me. Then notice the bottom left note that I can get 31 days of data. Jerks, but feel free to substitute another word yourself. 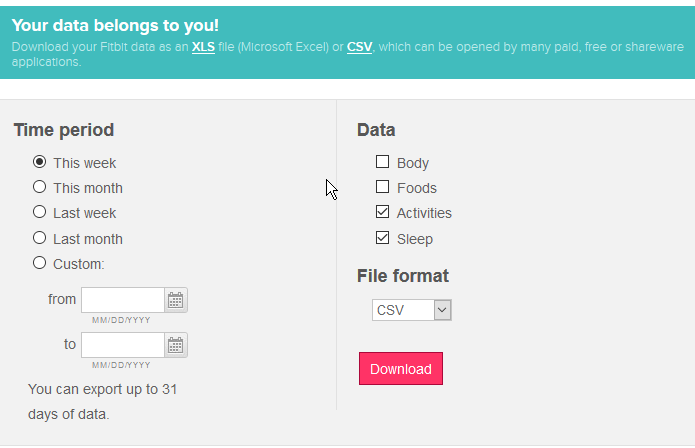 Then I found this Fitbit Data Export site. I connected and ran this, which grabbed my data. I appreciate there’s a Github link with the source code, though I have no idea of what’s in Github corresponds to what’s running in Azure. After reading The God’s Eye View, it’s a little nerve wracking to use a service to connect somewhere that I have data stored, but Fitbit exposes some of this publically anyways, and besides, it’s not critical data for me. In any case, I had a CSV of my data, which I am now going to upload into Power BI and play with it. Adding a CSV is straightforward. This entry was posted in Blog and tagged data analysis, syndicated. Bookmark the permalink. This is awesome. Thanks for doing the research on this! You are welcome. It was quick, but I had to play with it a bit. Thought it was worth sharing.